It’s that time of year when many people bail up in front of an air conditioner, but for us that grew up in the heat it’s a perfect time to be out and about. There’s time off around Christmas and New Year, and if you’re looking for something to get you outside there are worse things than pig hunting. If you think the heat is tough on you just think how it affects them. There is no better time of year to easily find a pig. They have to come to water, and water is scarce – easy! Seems simple enough, and for those of us that hunt on private property, farm dams are a great place to start. Rivers and creeks are just as good to spend time by. The middle of the day with temperatures sitting at 40⁰ Celsius and above is extremely hard on wild boar; and if they have the choice they are going to be in the water. If you know your country well you should be familiar with ALL the water points around. 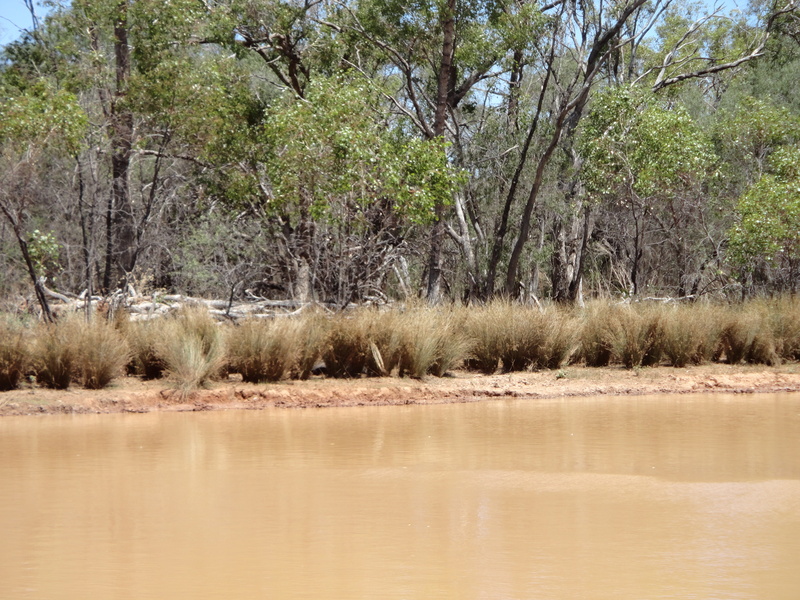 Don’t just focus on dams – in some places water holds in little holes in the middle of nowhere – particularly if the area has had rain recently. If one of these little holes exists in your country, it has great potential for a big boar. These old blokes aren’t dumb – they seem to actively seek out the places most people overlook. They don’t get big by hanging out in spots that are hounded regularly. Get to know your country well. Think about where water could get held up. Ask those that know the area best. Better yet, get outside and become the person that knows it best. It’s entirely likely that every watering point around will be visited by a pig at some time or another, but you can’t be everywhere at once. 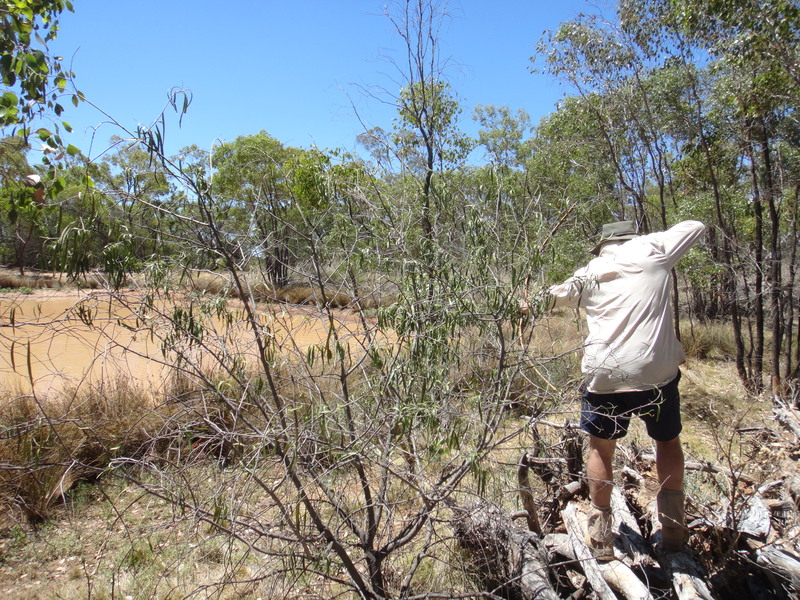 Check the waterholes for sign – fresh wallows (those that you can still see the impression of bristles in and that are still stirred up); fresh rub trees (where pigs have a good old scratch); and fresh camps under trees nearby are all good signs. The next thing to determine is when the pigs are visiting. It’s not much use to you if they are coming in during the middle of the night (unless you’re a spotlight kind of dickhead). The easiest way to do this is to wait until midday then start making the rounds. Make the effort – if you’re driving between points park well back and downwind then stalk in. Getting in undetected will give you a chance to learn something other than how fast a pig can get out of a wallow. If you stalk in, observe the area and find no one home, check the edge of the water for really fresh sign that might indicate a pig having been there earlier in the day. If the pigs have come and gone then just be there earlier tomorrow. If there is no sign from earlier in the day then it’s likely no one has visited yet. You can either set up camp in a good position and wait; come back later in the day; or come back later the next day and check again. The summer routine is geared towards being active during the cooler hours and resting in the heat. Pigs will wait until late in the evening before they get up, and will need a drink when they do – so they will start turning up on water points just on dark or shortly after to quench their thirst. Following that they will head out to forage and will keep that up most of the night. Come the early hours of the morning they will be feeling pretty dry again depending on what they’ve been eating, and they will start trickling in to water. Then there will be a last feeding session until around dawn when they will make the most of the lingering cool temperatures to snack on their way back to camp. Camp is going to be well back in a shady bit of scrub but; if safe; close to water. As the day heats up things start to get tough – a pig can overheat fairly easily and the summer can’t be a comfortable time for the poor buggers. By the time it hits 12 or 1pm you should be rearing to get out and about. Pigs will be filtering back to water by now if they aren’t already there. At the very least they will be nearby. A key thing to know, particularly of boars, is that they are creatures of habit. If a boar visits a dam at 12.13pm one day, he will be there at 12.13pm the next; unless he’s disturbed by you. If you put a pig off a water point one day while you’re doing other stuff – DON’T CHASE IT. Note the time and be there the following day. If the pig wasn’t stirred up it will be there. Take your time as you move, working into the wind, as there might be a pig lying up in the shade near to the water source. Pay particular attention to well covered spots – wilga trees with branches drooping to the ground were the classic camps where I grew up, but look under horizontal tree trunks, African box thorn, thick lignum – whatever provides a lot of shade and is hidden. As I said, move slow and look hard. Lots of times all you’ll spot is a bit of an ear, a snout, or a tail. Be ready for quick action – as you are the one moving about you are making yourself the most obvious creature in the area. Quite often while stalking around water where pigs might be camping all you get is a startled woof!, a scramble as a mob gets to their feet to assess the danger, and a second or two before they take off. Make those seconds count! Pigs occupied by wallowing or swimming are slightly more approachable but even then they are incredibly alert. An ear or an eye is always scanning the area so pay attention. Any pause in whatever they are doing is a warning that they might be onto you. Freeze and watch intently – either until they go back to what they were doing or blow out in a shower of muddy water. Doing the daytime rounds with dogs is another approach at this time of year. There is usually some pretty spectacular action as no pig wants to run in the heat, so if you want to see a big boar stand his ground from the beginning this is where you’ll get it. Fights often end up in the water too, which can be interesting! For all this, I can’t stress enough the importance of monitoring your dogs and keeping water within reach. 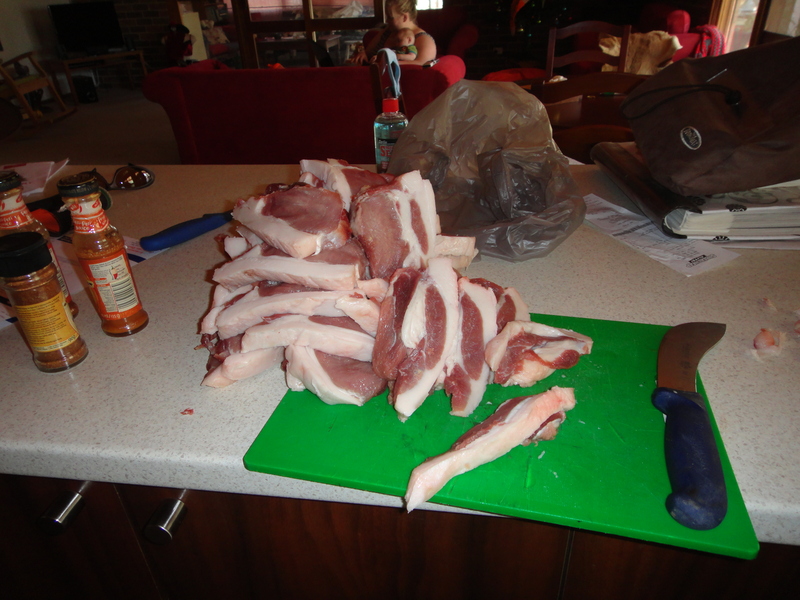 Just as the heat is tough on pigs, it’ll kill (or disable) a dog quick-smart. While you may feel fine, there are some key differences between your evolutionary biology and that of your dog’s. Namely the body’s cooling mechanisms. Do not work dogs hard in the middle of a summer day without water for them to drink and swim in. Summer is here, so make the most of the seasonal opportunities. An added bonus to getting out during the day is that you’ll appreciate a cold beer when you’re done, and hopefully have some pork chops for the barbie! It’s perfect weather for those sorts of activities too! A recent evening spent watching American hunting shows on TV reminded me just how vastly different the opposing ends of the hunting philosophy spectrum really are. It’s sad that one end of this spectrum has been turned into a money making enterprise by so many producers of gadgetry and gimmicky products. I’m not sorry to say that my philosophy towards hunting will never win me any friends there; and I have no desire to do so anyway. The stark difference between a top of the line compound or crossbow as compared to a traditional recurve or longbow is the perfect example of either end of this spectrum. I don’t have anything against compounds or crossbows as long as they are recognised for what they are: killing machines. I just like recurves and longbows (and shooting them instinctively), and the general hunting ethic that the use of these weapons seems to cater for. 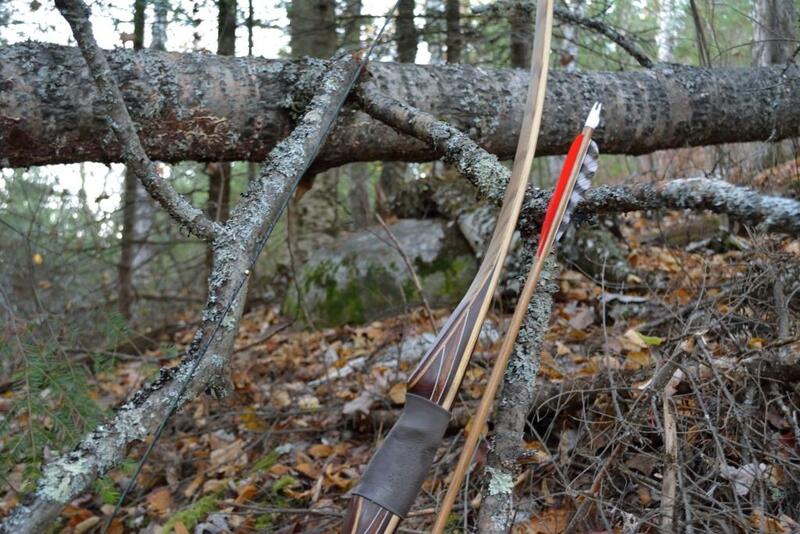 These bows make real hunters. Their use trains patience, dedication and modesty. They give an appreciation of simplicity, and remind us that shooting is supposed to be fun. Simple curves, wood and real feathers. And not a touch of camo in sight! I’ve included a short glossary at the end of this article to help explain some of the terms I use. Anything highlighted in bold is further explained there. I’m not referring to feet per second here – we know that wheels and carbon move quicker – I’m talking about speed of use. Shooting traditional bows instinctively is without a doubt a faster method of shooting a bow than anything else out there. In essence you put an arrow on the string, look at what you want to hit, and shoot it. No sights to look at or through, no distances to estimate or measure, no additional release aids etc. to consider, no let-offs to slow your draw. I’m serious. I’ve been out with people on several occasions where shots have presented themselves, fired and hit my target before my companions even realised there was a target there. If you can aim, draw and fire before someone standing directly behind you realises that you are lifting your bow – well, how much faster do you want? Shooting recurves and longbows instinctively is fun. You can shoot them standing up, sitting down, bent double or twisted sideways. The fact that there are no mechanical aiming devices (and particularly if you are shooting off the shelf) means that you can shoot at pretty much any angle. There are of course some things that should remain constant; your grip on the bow and your anchor point especially; but practice is much more fun when you aren’t restricted to set ranges and use of sights, right? This ties in well with the best form of practice when shooting instinctively (after mastering the basics): stump shooting. 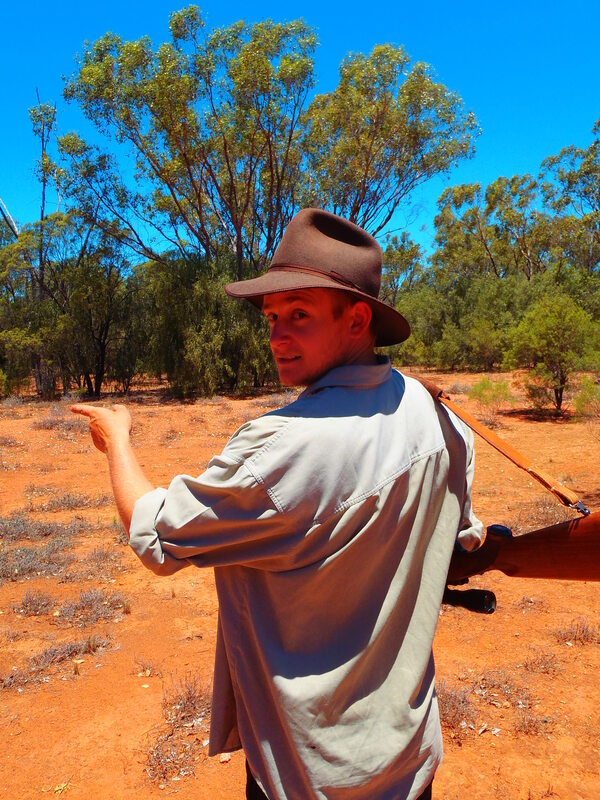 This is the generic term for just wandering around in the bush, shooting at whatever catches your eye. A fluttering leaf; a spot on a hump of dirt; my old favourite was a dry cow pat until I’d shot every one to bits on our 25 acre block. 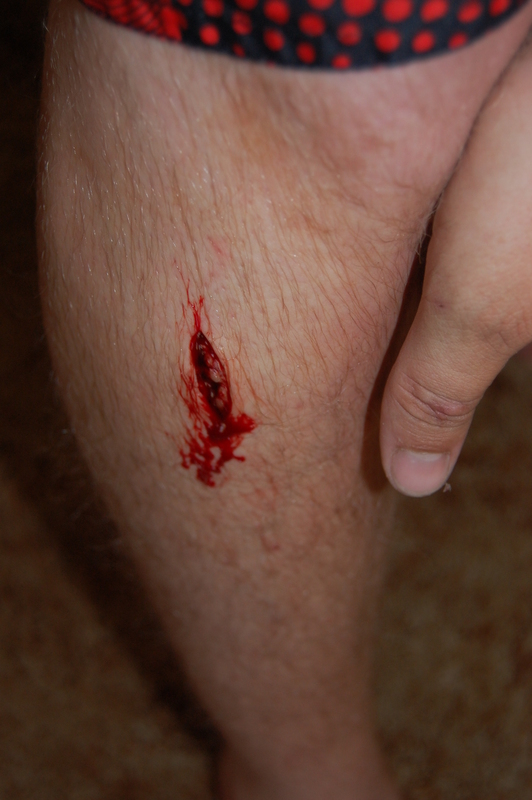 Of course, that dirt clod you aim at sometimes magically turns into a rock when struck by an arrow, but watching a wooden shaft splinter (while slightly sickening) is pretty awesome too. Or, like my dad, you can make a game out of shooting your sons arrows after he’s fired them (it’s amazing how fun this idea seems until one of your own arrows is destroyed). 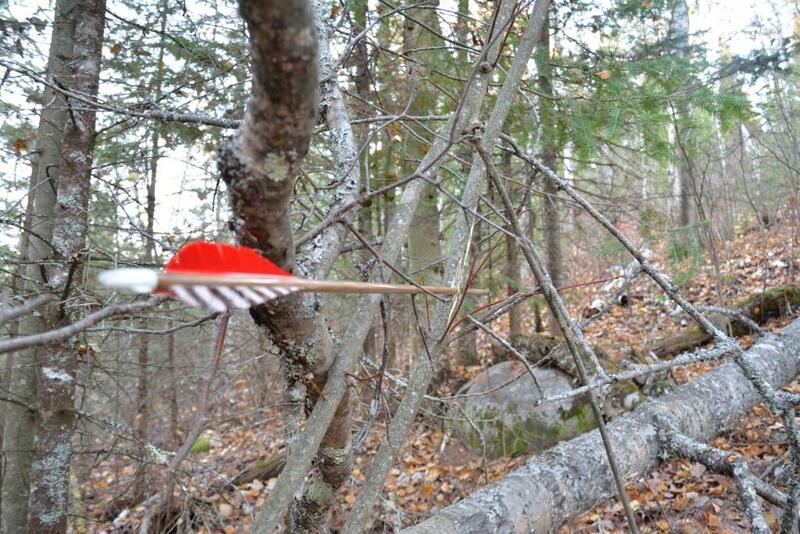 It’s always a good idea to carry some hunting arrows when stump shooting – you never know when practice might turn real! It’s also OK to miss when shooting instinctively. We all do it, no matter how good we are. Some of the best shots I’ve ever taken have been misses. If that doesn’t make sense to you then you might need to re-evaluate what you’re doing. 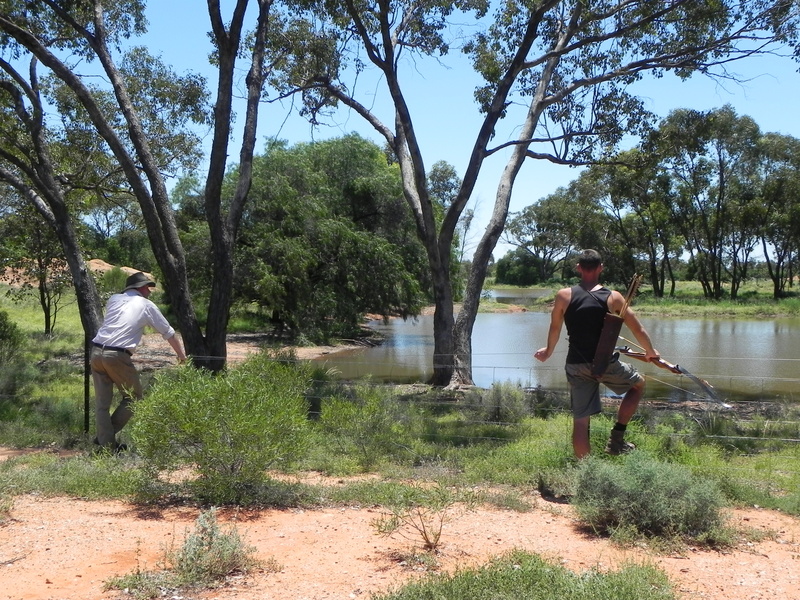 That’s what makes traditional archery and instinctive shooting so fun – you can enjoy missing. Anyone that thinks traditional bows aren’t deadly weapons is kidding themselves. The key here is a) shot placement and b) a sharp broadhead. If you put a shaving sharp broadhead into the vitals of an animal you will kill it just as dead as if it had been shot with anything else. We’ve killed wild boar that never even moved from where they were hit – just keeled over. I’ve dropped a running goat on the spot, just as efficiently as any rifle. Forget the Hollywood dramatization of archery, depicting victims bristling with arrows having only penetrated a few inches: hunting weight bows will punch an arrow clean through most game animals. These things are not toys. 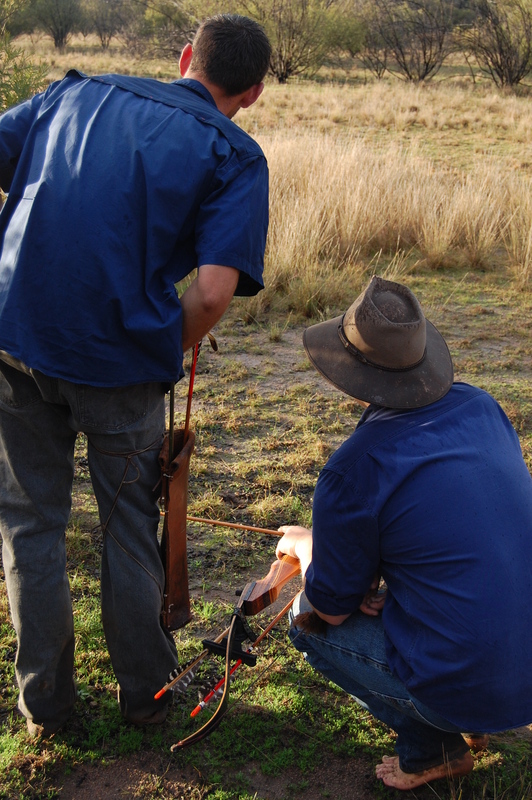 If you’re interested in having a go at traditional archery, heading to a local club is a great opportunity to meet like-minded people and have a crack at shooting. I went along to a few shoots with the Hunter Valley Traditional Archers (http://traditionalarchers.org.au/?doing_wp_cron=1416514449.6688199043273925781250) when I was living in Newcastle and had a great time. Instinctive Shooting – shooting a bow without the use of any sights or aiming (including sighting down the arrow). Hand-eye coordination is used to shoot, whereby; with practice; the brain works to point the hand (or more correctly the arrow) at a point focussed on by the eye. When this process is repeated so that it comes without conscious thought, the archer is shooting instinctively. Shooting Off the Shelf – Most commonly associated with shooting recurves and longbows. The arrow is rested on the bottom of the sight window of the bow (or on the top of the bow hand with traditional longbows); thereby putting the arrow as close as possible to the ‘pointing’ hand used in instinctive shooting and creating an ‘in-line’ form from the eye through the hand and arrow and to the target. Even when the bow is tilted to the side, the arrow remains on this line. Anchor Point – A constant point that the string hand reaches at full draw of the bow. For many, this is the index finger of the string hand touching the corner of the mouth; but various anchors exist. A consistent anchor creates a consistent draw, vastly contributing to accuracy under varying other conditions. Stump Shooting – A form of practice in which the archer rambles and creates targets out of things that catch the eye. Valuable due to the similarities to actual hunting conditions; targets are frequently at unknown (particularly important to instinctive ‘memory’) ranges, thereby challenging the brain to instinctively adjust to account for varying trajectories. This skill is highly valuable as in enables the archer to hit targets at any (within reason) range without having to think about it. The month in the United Kingdom was going well and I had already made good on a couple of things that I had wanted to achieve, catching a couple of pike (including my 26lb monster) and my first brown trout. So to keep the ball rolling, it was time to head to our next destination. After a couple of days to regroup and catch up with family we were on our way to North Yorkshire to find a roe buck. 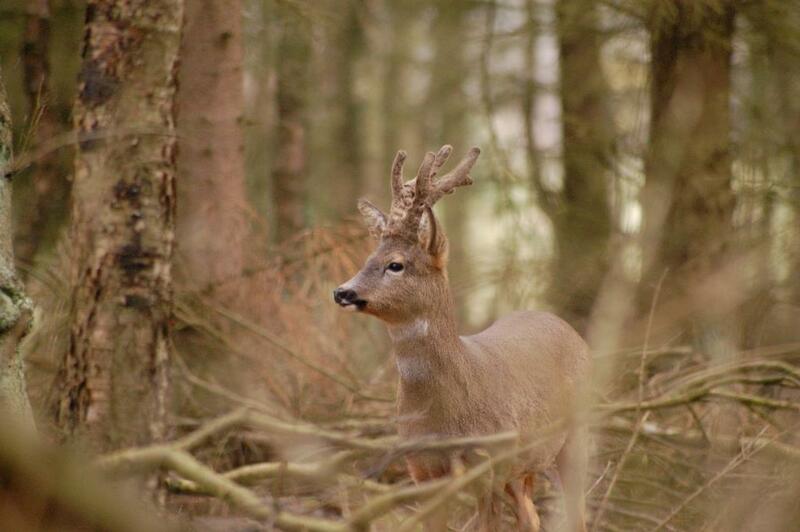 The roe deer (Capreolus capreolus) is one of the two deer species native to Britain, the other being the red deer (Cervus elaphus), and is naturally found in woodlands where it browses on several types of vegetation. 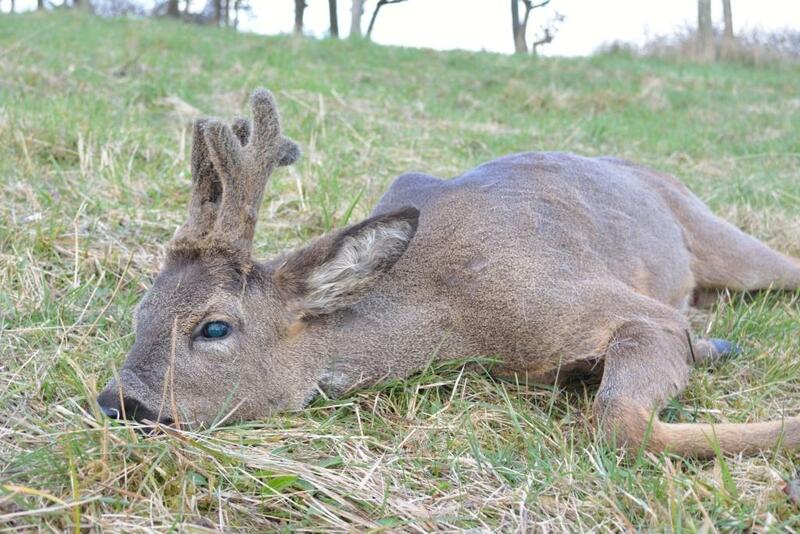 Historic overexploitation and habitat modification led to a considerable range restriction of the species and by the 1800’s the roe deer had been extirpated from England, holding out in more remote areas of Scotland. From here, and via some small scale reintroductions, the species has again spread to occupy most of its former range. It’s now not unusual to see a roe or two hanging out on the wooded edge of a field or along a hedgerow in the middle of the day where hunting pressure is no longer a disturbance factor. Even so, they are commonly overlooked by the general populace that runs and power walks the paths and roadsides. Trust me; they are there if you just look. Where these animals are still pursued they are plenty wild, and I’ve always felt privileged to be out and about as first light is starting to illuminate a misty wood or field, and to see the dainty form of a deer out feeding and unaware of my presence. I spent a bit of time stalking roe while in the UK three years ago and had plenty of memorable encounters with the both the rifle and camera. That time I was hunting does, but this time I was around for the start of the buck season which, in England, runs from 1 April until 31 October. We weren’t expecting a dust storm to hinder our initial efforts at locating deer; but our first few outings were shrouded in grey murk fresh from the Sahara, of all places. You see something new every day. Even so, we did determine where the deer were located on the farm we were doing most of our hunting. A few deer were poking about on north-facing slopes rising onto the North Yorkshire Wolds; at least four were hanging out in a narrow strip of wood backing onto the Cut (a small canal draining the surrounding fields); and six deer were living in another field along the Cut that had recently been harvested of its sheltering crop of Miscanthus grass. We hadn’t seen any mature bucks but scattered brashing (where a buck had scrapped with a small tree to rid his antlers of velvet) told us that something bigger than the young bucks we knew about was getting around. One morning while stalking into a position to observe the Miscanthus deer we crossed a narrow bridge over the Cut. A movement in the water catching my eye, I looked to see a lit-up pike darting about before seeing me and taking off. 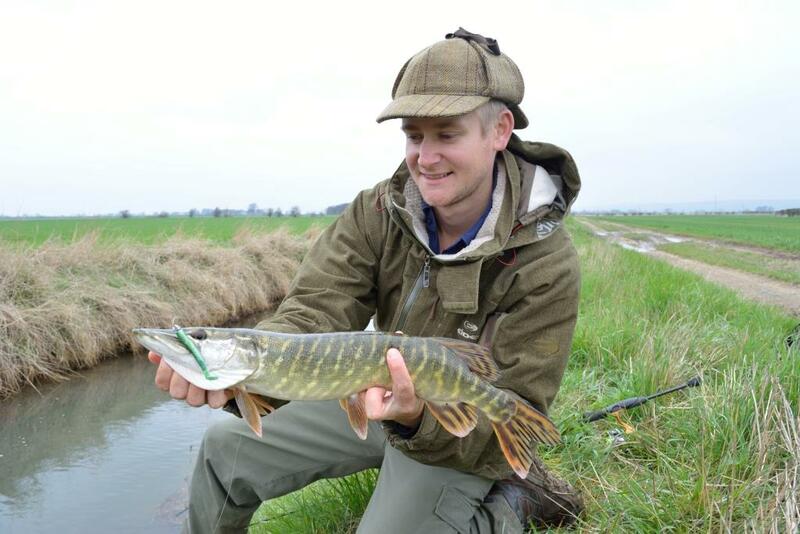 Considering that the Cut is only a foot deep in most sections and about eight to ten feet wide, this was an exciting observation (we did put some effort in that afternoon, and came away happy with a cracking skinny-water pike capture). Our fourth morning out found us stalking the slopes on the Wolds. Overlooking the country below us we could see the six Miscanthus deer out and about in their field in the distance. Too far away for the morning, we focussed on getting to a reliable spot close by; a small wooded hollow providing good cover for wary eyes. Generally, we would stalk in from above the hollow on an opposing slope; however the westerly wind of the morning dictated that we would have to stalk in from below it. This meant that we wouldn’t be able to see what was in the hollow until we were right in amongst it. True to form, as we crept over the lip of the hollow two deer burst out and took off up the hill. Lying down and resting the .25-06 on its bipod, I waited for the inevitable look-over-the-shoulder of the young buck as he reached a vantage point out in the distance. I heard dad saying “aim high on the shoulder” as the buck stopped and turned back to see exactly what had disturbed his morning activities. 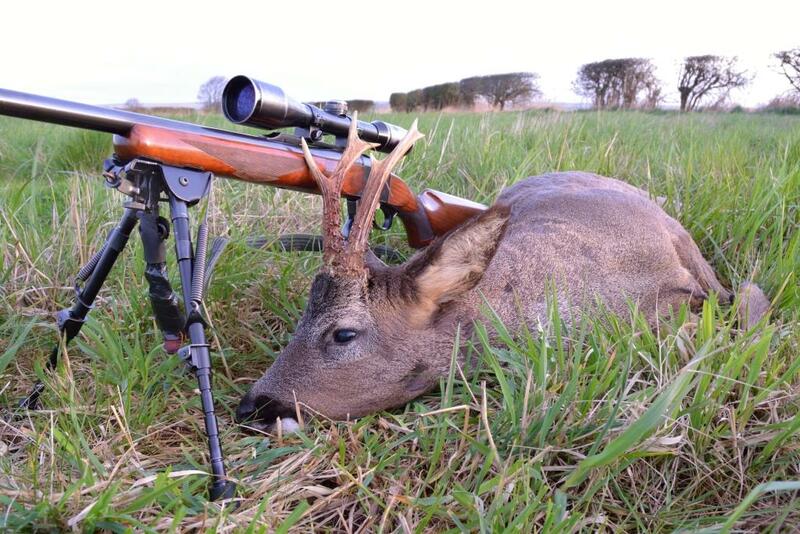 The shot rang out and I heard the thud of the bullet as the buck dropped. A young buck, still in velvet, we admired him as the woodpigeons clattered out of the trees, before grallaching him and carrying him out between us. Three days later found Dad, his mate Lee and I watching the Miscanthus deer as darkness set in around us. From our viewpoint on a bridge over the Cut, we observed the does browsing along the boundary hedge, and in the neighbour’s fields beyond. Suddenly a young buck came streaking across the field and hot on his tail was a bigger buck. The big buck chased him from one end of the field to the other, before they turned and dashed back the way they had come. There was the mature buck we had been looking for. Dawn found us creeping along the Cut headed for the Miscanthus field. As we passed the end of ‘Crooked Edge’; the hedge marking the farm boundary; I spotted the back of a deer silhouetted underneath the next hedge over. The deer lifted its head and we could see that it was a buck. For now though there was nothing we could do as he was on the neighbours land. Putting him out of our minds we continued to stalk onto the Miscanthus but found it to be occupied only by the numerous local hares. Peeking back over my shoulder I saw the buck again; he was working his way towards our farm boundary. The wind was now angling back towards him so we moved as quickly as we could back over the Cut to keep our scent out of his way. He was still feeding along his hedge when we crawled into a good viewing position under the Crooked Edge. Now the waiting and hoping began, as the buck meandered about in front of us while still out of bounds. He was a beautiful looking animal; heavy bodied with a boof neck and white polished tips to his striking brown antlers. We watched him feed for a good five minutes, tucked away in our hedgey hidey-hole while the early morning countryside came to life. We whispered a plan for where he would need to be to take a safe shot – if it came to that. We simply enjoyed watching him. As he came to the end of the hedge he was feeding along the all-or-nothing moment arrived. Would he continue to feed in the line he was travelling? That would take him over the boundary and into the danger zone. Would he round the hedge and disappear? That would take him into safety for at least another day. He turned and sauntered around the hedge. We laughed and cursed. Typical! Wait… He was back! He wandered out and across the opening between the two fields at an unhurried pace while my heart quickened a little at the understanding that I was about to take this deer. As he came into the safe shooting zone a distant noise made him stop fully broadside, his head high and looking out across his territory. The shot was good and he fell where he had stood. The sun broke over the horizon. A short-eared owl broke cover. We shook hands before making our way over to our breakfast. Fresh venison liver after a morning like that is hard to beat.